Sorry if this has been posted already, but for those who are in the United States, Costco actually sells a few Kose Sekkisei products - the lotion, moisturizer, cleansing oil and powder wash. The powder wash is great and nice for traveling (since it's not in liquid form). Shipping is free and very fast. ETA re the powder wash - I've used a similar product from Dior (almost identical, down to the fragrance) and it was 4xs as much. k8y replied to yuzuangel's topic in Community Talk: Tickets, Meetups, etc. I'm selling the following tickets for the GPF Exhibition Gala (Dec. 9): Section 103, Row 16, Seat 8 Section E-BL, Row 1, Seat 23 Section E-BL, Row 1, Seat 24 Price negotiable. Please PM me. I accept paypal and can transfer tickets through TM. The gala tickets have been sold. The gala tickets have been sold. Thanks. I'm looking for 2 all event tickets, next to each other. Thank you! The first day of my vacation and I could think of nothing better to do than go back and watch a suspenseful, nail biter of a movie with an extremely satisfying ending, starting from around page 2500 of this thread. I quote some highlights from the very first scene. LOL. LOL. Did you see Finger's response to your suggestion that Flight of the Pigeons sounded more like a Ilia Averbukh program? "That would have been amazing. I can make up for it by writing a story about Averbukh passive-aggressively trolling Orser with Icarus/Talonflame memes after Medvedeva's move." LOL. 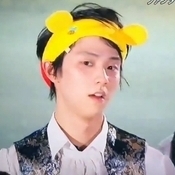 My husband usually rolls his eyes at my Hanyu love. I was watching a clip with the original Seimei backward crossrolls, and decided to show him. He watched with rapt attention but didn't say anything. I asked him, "You want to watch that again?" He said, "Yeah, sure, whatever." I don't know that I would personally equate these two situations. 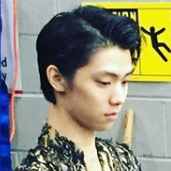 I don't have an opinion on Dai's motives and intentions, but I think that if Yuzu thought there was a pattern of someone trying to physically interfere with him during practice sessions and the way to quickly shut down that kind of behavior was to publicly address it, then I think he has a right to do that. At the time he said he reviewed the video evidence and believed it was purposeful, so it's not like he made the statement carelessly. I think on certain things, like his physical safety, he should be able to defend himself, whatever the fan reaction. 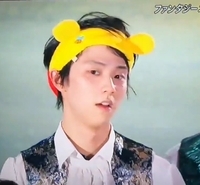 Aww Yuzu as a doddering old man still looks kinda hot. Should I not have said that out loud? I love him. I love him especially today because some of the unpleasantness that he has gone through in the past has been dredged up today so I'm proud of all he has accomplished and will accomplish. In my mind, many times. Sorry, but I'm not quite sure what you all are referring to. Perhaps you can help me out with some hi-def pictures or, for the artistically inclined, detailed illustrations.